Bonn has so far reduced its CO2 emissions by 14% compared to 1990 levels. The city aims to reduce its CO2 emissions until 2020 by 40% and by 2050 by 90-95%, reaching 2.5 tonnes per capita in 2030. Building on a well-developed bike path network, Bonn wants to become the bike capital of its region by 2020. Along the banks of the Rhine river and in the narrow streets of Bonn’s city centre, cycling is a pleasant activity and an important mode of everyday transport for its inhabitants. But the city of Bonn wants to go the extra mile and become the “cycling capital” of North Rhine-Westphalia, in western Germany. Bonn is a lively city with a population of approximately 310,000 inhabitants. The capital of Germany until 1990, when the Iron Curtain fell and Berlin took the helm of reunified Germany, Bonn still hosts six federal ministers and a number of international organizations, companies and NGOs, including 19 United Nations organizations, DHL, Deutsche Telekom, that make Bonn an open city where sustainable future is discussed and built every day. 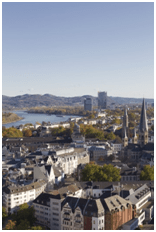 In 2011, the city of Bonn obtained for the second time the European Energy Award (EEA) in gold for its outstanding success in saving energy as well as its efforts and projects in climate mitigation. As of 2010 Bonn had already reduced by 14% its CO2 emissions compared to 1990 levels. The city aims to reduce its CO2 emissions until 2020 by 40% and by 2050 by 90-95% in comparison to 1990, also committing to halve emissions per capita before 2030. The long-term goal is to reduce greenhouse gas emissions to a sustainable level of 2.5 tonnes per capita. If the medium and long-term energy saving plans will be implemented, Bonn will spare the atmosphere 286,000 tonnes of CO2 per year. In order to reach these ambitious goals, the city of Bonn is counting on sustainable transport as an effective and rapid measure to cut greenhouse gas emissions while improving the life of its citizens. Companies in the hospitality and tourism industry are already offering deals for cyclists to take advantage of the booming cycle tourism phenomenon and bikes are at the core of the city’s transport plans. A bike-friendly city, Bonn has set very ambitious targets to go further down the road of sustainability. Plans are to double bike share in city traffic by 2020, reaching 25%, while ensuring that ever less cyclists get hurt by halving the number of cyclists seriously injured or killed in road accidents and bringing blackspots (particularly dangerous spots in the city for the number of accidents occurring) down to zero. The “2020 Bike Paths Capital” project will take a number of actions to expand and improve the existing bike paths, improving safety for cyclists and reinforcing the network of bike paths. Parking for bicycles will also be expanded and bike paths will be linked to public transport to allow citizens to easily create sustainable itineraries within the city.